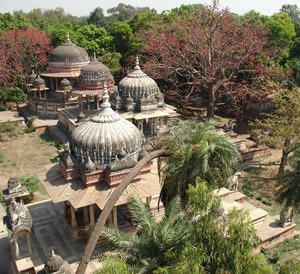 Getting to know a bit about the past of Kota we suggest will make your trip that much more interesting. We hope the facts are right, but even if we are not entirely accurate it still makes for an interesting read! Older books and references use the British spelling Kotah and we have used this spelling on this website, as well as Kota. Of course, it is spelt Kota today. Akelgarh, on the right bank of the Chambal river, and 10 kms upstream of Kota, was the seat of power of the tribal Bhils who ruled over the adjacent area. During thirteenth century A.D. there were frequent skirmishes between the Bhils and the Hadas, who had recently acquired the Bundi principality to the north. In one such battle in 1264, Jait Singh, the younger son of Samar Singh of Bundi slew the Bhil chieftain, Kotya and captured Akelgarh. He was so impressed by Kotya’s bravery that he named his newly conquered principality Kotah after him. The severed head of Kotya was buried in the foundations of Jait Singh’s new fort. Kotya has been honoured and remembered daily ever since in the Kotya Bhil Temple. This is in the outer wall of the Palace to the left of the main gate. Kota may be the only town named after the loser and not the victor! In the later Mughal administrative structure Kotah and Bundi formed a part of the Ajmer ‘suba’ until Kotah was separated from Bundi in the 17th Century. Rao Surjan of Bundi had won a favourable position at Akbar’s Court by handing over Ranthambhore, which he had gained from the weakened Rana of Mewar (Udaipur). Rao Rattan of Bundi entrusted the jagir of Kota to Madho Singh in 1624 A.D.. Madho Singh played an important role in putting down the rebellion of Prince Khurram, eldest son of the Mughal Emperor Jehangir, but he befriended him when the Prince was in custody. When Prince Khurram became Emperor as Shah Jehan he confirmed the jagir of Kota for Madho Singh. His cenotaph can be seen in Ksharbagh (Garden of Ashes) near Kishore Sagar lake. Because of such interaction between the Rajput nobility and the Mughals, the art of miniature painting became established in the Rajput courts at this time. 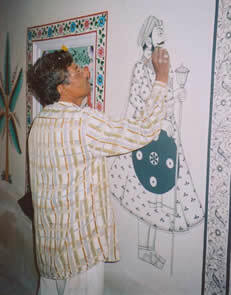 Bundi painting can be traced back to 1650. Kotah painting as a separate school appears to belong to the reign of Rao Jagat Singh (1657-84). It was at the end of the seventeenth century that weavers arrived from Mysore to train the Kota weavers in their special light weaving techniques using cotton and silk with gold and silver zari (threads). Rao Kishore Singh (1684-95) was a general in the Mughal Army and was fighting in south India. He and his son, Rao Ram Singh (1695-1707) were instrumental in bringing the weavers from south India to certain villages to the south-east of Kota. The material woven in Kota came to be called Kota Masurias as the weave originated in Mysore. The original weavers from south India did not stay and the tradition has died out in Mysore but is still strong in Kaithoon, 22kms south-east of Kota. The weave is now known as Kota Doria. After Emperor Aurangzeb’s death in 1707 the Marathas began moving northwards from the Deccan Plains into Hindustan. One route lay via Kota and by judiciously helping them Kotah was able to acquire further land and influence. Later when the Marathas joined forces with Jaipur in 1745 to attack Kotah. Rao Durjan Sal inspired his men to withstand a siege of 61 days and the city remained unassailed. Rao Durjan Sal was a particularly pious Hindu and rescued some cows that were being killed for the Emperor’s kitchen. He slew the men whose job it was to kill them and brought back the cows to Kotah. He set up a gaushala (cow shelter) for them which was maintained by the State until 1948. There are still very strong anti-cow slaughter sentiments in Kota and the three main gaushalas are now maintained by the Municipal Authorities. In 1761 Jaipur tried to claim overlordship over the Hadas of Kotah but a young 21 year old called Zalim Singh Jhala so decisively beat them at the Battle of Bhatwara that they gave up their claim for ever. He became the Faujdar of Kotah. This post was part of the Mughal administrative structure and involved raising troops and collecting revenue. This he did very efficiently. He repaired and fortified all the existing forts of Kotah state and erected new fortifications around Kotah city unequalled in size and strength in India. He adopted European weaponry and built two gun foundries as well as reforming the administrative and revenue collection systems. He was also very interested in horticulture and introduced many exotic species of trees and plants. With Zalim Singh as the regent and defacto ruler Umed Singhji (1771-1819) was free to hunt and patronise the arts. It was during his reign that Kotah painting reached its first peak. In 1817 under Zalim Singh’s leadership, Kota became one of the first Rajput states to sign a treaty with the British. His family was granted the right to be Diwan (Prime Minister) in perpetuity. This was inevitably to lead to trouble later. There were so many attempts on his life that he slept in an iron cage. Kotah stood at the gateway to Rajputana for the Marathas and Pindaris. It was able to use its geographical postition to good effect and rose to eclipse Bundi in terms of size and economic activity. Zalim Singh managed to make treaties with the Marathas so that Kotah was spared devastation and could develop its agriculture and become the granary of Rajputana. The area’s wealth lies in its rich black clay soils which retain moisture and are productive even in years of poor rainfall. In 1819 the new Maharao Kishore Singh wanted to be the defacto ruler and clashed with Zalim Singh, who although blind and in his eighties was determined to hold on to his power. At one point the Maharao fled to Bundi but Zalim Singh merely placed the Royal wooden sandals on the throne and carried on. A battle even took place in 1821 which Zalim Singh and his supporters won. He finally died two years later but the quarrel continued with his son, the new Faujdar. The British realised that the position was untenable and with the reluctant consent of Maharao Ram Singh partitioned the state into Kotah and Jhalawar states. Zalim’s grandson, Madan Singh Jhala, became the first ruler of Jhalawar in 1838. Under the agreement the tribute that the state had to pay to the British was reduced but Ram Singh was forced to maintain an auxiliary force of troops known as the Kotah Contingent. After a long legal battle two thirds of Jhalawar State was restored to Kotah in 1899. Despite the major part that the British played in such negotiations Kota was an independent Rajput state and was not directly administered by the British. They posted a Political Agent who lived to the north of the City in a house which is now Brijraj Bhawan Palace. The British surgeon lived in a house in the same compound. (Later a separate house was built for him which is now Sukhdham Kothi.) The Agent’s job was to liaise and to enforce peace. In 1857, the then Political Agent, Major Charles Burton along with his two eldest sons died fighting the revolutionaries. They were led by Lala Jaidayal who had a personal grudge against him and a Cavalry Officer Mehrab Khan. Delhi had just fallen to the British and revolution was in the air. The British surgeon was also killed and so were some Indian medical personnel. The Maharao was kept a prisoner in the Garh (Fort) from 15th October onwards until the revolutionaries were driven off by the arrival of Major General Roberts in March 1858. The leaders were hanged where the Collectorate Circle is now. Major Burton’s tomb can be seen in the British Cemetery in Nayapura. Maharao Shatru Sal II who succeeded Ram Singh showed no interest in matters of state and Kotah was soon in deep debt. The Government of India intervened and appointed an administrator who cleared the debt by 1885. As he was issueless he adopted a young cousin from Kotra near Udaipur called Udai Singh, who on becoming the ruler in 1889 became known as Umed Singh II and ruled until 1940. The Royal Family moved out of the old Garh Palace into the newly constructed Umed Bhavan Palace in 1913. Half of this impressive Edwardian Palace is now a Welcome Group hotel and the other half is home to the Rajmata (Queen Mother). At his wedding, her son Maharaj Kumar Brijraj Singh moved into the former British Residency which became known as Brijraj Bhawan. The railway line from Bina, in present day Madhya Pradesh, was extended from Baran (east of Kota) to Kota in 1905 so that the British could bring troops into Rajputana. A shorter route between Mumbai and Delhi (than the one by Bhopal) was finished in 1908 and Kota became connected to both cities by a broad gauge line. Other lines followed so that Kota became a railway hub with good connections to most parts of India. A system of dams and reservoirs was built upstream of Kota on the Chambal river between the late 50’s and early 70’s, and Kota Barrage was completed in 1960 to store water for irrigation and for drinking purposes for the rapidly growing city. Water for irrigation was taken to a large area via the Right and Left Main Canals. The Right Main Canal also takes irrigation water to Madhya Pradesh from where the Chambal originates. Hydro electric power started to be generated at Gandhi Sagar Dam (completed 1960), Rana Pratap Sagar Dam (completed 1970) and Jawahar Sagar Dam (completed 1972) upstream on the river Chambal south of Kota which subsequently became the main generators of power in Rajasthan. A nuclear power station was built with the help of the Canadians in the sixties. It is further upstream at Rawatbhatta. A thermal power station was built in the eighties next to the Kota Barrage on the left bank, and there is a gas powered power station downstream at Anta. Solar power is now also being developed and the Forest Department uses it to provide water and light at its properties scattered through the Wildlife Sanctuaries. Back in the early sixties, power intensive heavy industry was lured to Kota with the promise of cheap electricity for twenty years to offset the extra costs of getting the raw materials there. In 1961 owners of Delhi Cloth Mills began making PVC resin, caustic soda and calcium carbide under the name of Shriram Chemicals. DCM later opened an urea fertiliser plant in 1970 under the name of Shriram Fertilisers. They are still operating in Kota, and have added cement and value added PVC goods to their product range in this region. Another related concern Shriram Rayons makes yarn in Kota. The corporate complexity of ownership of these companies has been simplified for the man in the street in that they are all now called DSCL. It is still a major employer. Other industries have come and gone but Chambal Fertilisers is now also making urea 30 kms east of Kota and is another mainstay of the local economy. There are various soya bean extraction plants and Samcor make television tubes but these have all been superseded in employment and tax generation terms by the new vibrant Exam Coaching Industry with its associated need for hostels and student facilities. Of the craft industries, the hand weaving of saris on traditional pit looms is the most notable. The genuine Kota Doria saris are now unique to Kota and an important tourist attraction. Kota stone is famous throughout the world. The characteristic blue limestone can be seen on hotel floors all over India. The red Mandana sandstone is popular in Europe for use as paving and cobbles. Kota now exports over 30 containers of stone a month via Kandla in Gujarat. Kota also has a large well kept cantonment area. It has an Engineering College and an Open University and specialist hospitals and training facilities are opening all the time. The town now has a population of 800,000 and claims to have the highest literacy rate and the most educated population of any town in Rajasthan.